> Andy Warhol | Ai Wei Studio Cats - free exhibition on until 24th April 10am to 5pm. The continuation of the main Andy Warhol | Ai Weiwei's exhibition. The space is split into two showing the artists' love for cats, the left side dedicated to Andy Warhol's and the right side dedicated to Ai Weiwei. Read our review here. > Our Land is Alive: Hermannsburg Potters for Kids - free exhibition on until 10th April. Read our review here. > Meet the Hermannsburg Potters - free program on the 6th, 7th, 9th and 10th April at 10 am. Meet the Potters from Hermannsburg, Northern Territory and learn about the techniques they use to create their signature terracotta pots. More info here. > StArt Up: Top Arts 2016 - free exhibition on until July from 10am to 5pm. Forty-two of the state’s most distinctive up and coming artists will exhibit their work at the NGV for the first time at the annual StArt Up: Top Arts 2016. The exhibition celebrates the best of VCE Art and Studio Arts and features 49 works, drawn from 2,500 submissions. More info here. > On until Sunday 17th April. Roaring and moving dinosaurs, Dinosaur Train show, sand art, sand pit, fossil display, children can become a paleontologist and more. Melbourne Minor's review for us here. > On until Sunday 9th October. Realistic, life-size animatronic dinosaurs set in highly themed environments inspired by the film and an interactive lab where you can conduct your own dino research. Melbourne Minor's review for us here. > Melbourne Zoo - Children can find their inner wild child and checkout the new Keeper Kids outdoor play space. > Werribee Zoo - See the three growing lion cubs at play, see a daily school holiday performance of 'How The Lion Got Its Roar' and a family of lions to care for in the Ranger Kids area. > Healesville Sanctuary - Discover the iconic burrowing species including wombats, echidnas and platypus and maybe meet the twin platypus. > Scienceworks - Checkout Capturing the Cosmos, Astro Adventure, The Light Spectacular and the Space Tape: An Ever Expanding Universe holiday program. 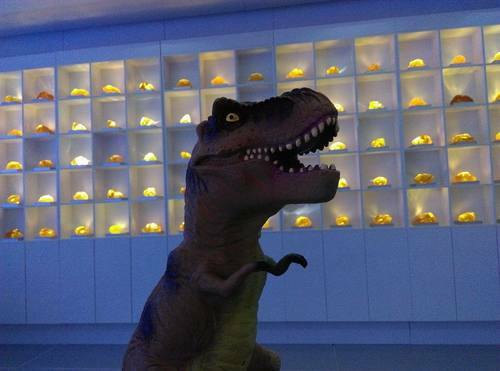 > Melbourne Museum - Checkout Jurassic World: The Exhibition and The Science of eggs holiday program. Full info via this link. > The 52-Storey Treehouse show opened its doors at the Arts Centre Melbourne yesterday Friday 1st April. Our friends from Moonee Valley Kidz checked it out for us and loved it! > The Royal Botanic Gardens are holding activities during Nature Play Week from Wednesday 6th to Sunday 17th of April.